A British-built Mars lander that vanished after a failed touchdown on the Red Planet in 2003 may have been spotted by an orbiting spacecraft. The Beagle-2 Mars probe may have been spotted near its intended landing site, according to reports. The UK Space Agency announced it would provide an “update” on the probe Friday, but refused to divulge further detail in advance. 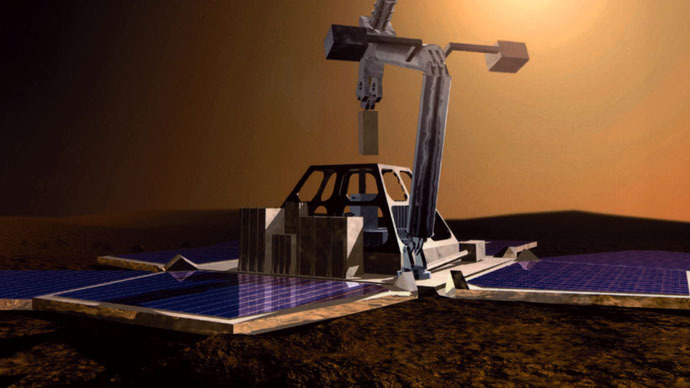 Beagle-2 was meant to travel to Mars in search of past or present life. It initially traveled with the European Space Agency's Mars Express orbiter and was successfully released on December 19, 2003. The lander was intended to deploy a parachute on its descent to the surface of Mars and inflate triple airbags to cushion its impact. It was expected to land on Mars on Christmas Day, but it never sent the expected signal confirming touchdown. Scientists assumed at the time that Beagle-2 had broken up on impact. Scientists operating the highly-detailed HiRise camera on NASA’s Mars Reconnaissance Orbiter will take part in Friday’s conference. A senior space scientist told The Times HiRise images revealed an object “about the right shape and in about the right place” as the lost lander. Speculation remains as to what happened to the lonely probe. It was deemed unlikely that Beagle-2 had missed the planet or burned up in its atmosphere. Many assumed it had suffered a malfunction with its parachutes or cushioning airbags. British planetary scientist Colin Pillinger, who died last year, was the driving force behind Beagle-2. In 2005 he claimed images of Mars’ surface taken by NASA’s Mars Global Surveyor may have shown a glimpse of Beagle-2. He believed the probe may have hit the ground too hard, as a result of a thinner-than-expected atmosphere following a Martian dust storm. He said the images suggested Beagle-2 came to rest in a crater closed to the planned landing site. Beagle-2 was a unique space mission because it was largely funded through private donations and money raised by promotional campaigns led by Pillinger. It was also seen as a truly British mission. Its call-sign was composed by the Britpop band Blur, and artist Damien Hirst painted the probe’s “test card” to calibrate its cameras and spectrometer instruments after landing.